Title: Dahlias and Gladioli. An original silk painting. 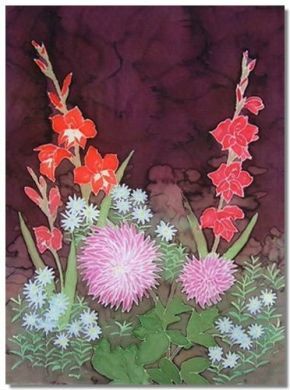 The vibrant red of the gladioli make a vivid contrast against the rich plum background, which has been given depth by the careful use of watermarking. The picture is attached to padding which has been stretched over a picture frame and is ready to hang. Dimensions 46cm wide x 61cm high.